My hair is one of my biggest challenges, for lots of reasons. It is fine, dark brown with a few stray wiry greys, and for most of my life has been so oily to the point that I have washed it daily for as long as I can remember. 24 hours after washing my hair looks greasy, straggly and far from beautiful. There are many reasons to look for alternatives to shampoo and conditioner: they come in plastic packaging. These products are mostly water, so they are bulky too and therefore need more packaging. It is made with all manner of chemicals which may or may not be good for you. Most of them (all?) contain some form of Palm Oil derivatives which may be fine for you but not so much for the orangutans whose habitat is being steadily destroyed to make way for palm oil plantations. The big companies who produce this stuff want us to buy it and spend considerable dollars to convince us that their products are just what we need, but might it be possible that we don’t even need them for our hair to be in good condition? I first came across the No ‘Poo concept around 7 or 8 years ago – where you abandon shampoo in favour of a Baking Soda/Apple Cider vinegar alternative. I may have been overzealous: my daily hair washing habit was hard to break, so I didn’t: I just replaced the shampoo & conditioner with BS and ACV. While the regime seemed successful in the early weeks, three months in my hair was drier than a desert and showing a marked resemblance to that of a straw man. While I have subsequently discovered that weekly washes are the maximum recommended when washing with BS & ACV, the experience was enough to frighten me back to my regular Unilever products. This year I tried another tack: I went searching for shampoo with no palm oil and no plastic; at least I’d be saving the orangutans if nothing else. To my delight I found that Lush make both solid shampoo bars and solid conditioner bars. 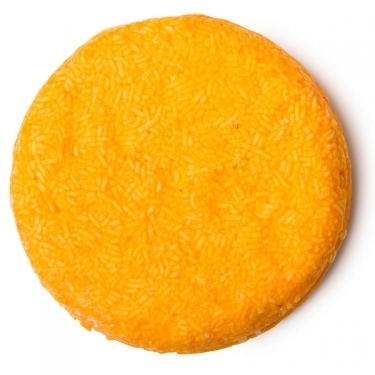 I am now on my second shampoo bar, the Brazziant solid shampoo bar in a vivid orange, and I am a convert. Each bar lasts for 60 washes – that is 2 months in my case. My hair is wonderfully clean and shiny. After trying my first bar with no conditioner – simply choosing to give up conditioner, this time I am trialing Lush’s Big Solid Conditioner with a coconut oil base, and I have been amazed at its effectiveness. I can truly recommend it. Tonight I read this article on how to go No Poo. I also found this blog about one woman’s experience of going down this track and am much inspired. I’m really happy with the Lush products and they are fulfilling my no-plastic mantra, however it is still more products than I need if it were to transpire that I really don’t need shampoo at all. So I’m considering having another go a ‘no Poo’ and being a bit more moderate with the BS washes.